"Not Over You" is a song by American recording artist Gavin DeGraw, released as the lead single from his fourth studio album, Sweeter, on May 17, 2011. The song was written by DeGraw and Ryan Tedder, and produced by Tedder. The song poignantly evokes the difficulty of getting over someone. It received a positive critical appreciation. The song has charted on the United States's Billboard chart and also in many European territories. It peaked at No. 18 on the Hot 100, making it DeGraw's most successful song on the chart since his breakout hit "I Don't Want to Be", becoming his fourth Top 40 hit. It is also his first song to reach the top spot on the Adult Pop Songs. The accompanying music video shows DeGraw coping with a heartbreak after a tough split with his lover, but he finds it hard to let her go. The first single from singer-songwriter Gavin DeGraw's fourth album, Sweeter, was a collaboration with OneRepublic's lead singer and songwriter Ryan Tedder. According to "Songfacts", the pair initially met when they performed on the same bill and the two, both groove-minded piano players, decided to write together. Not Over You is one of two songs DeGraw co-wrote with Tedder for the LP. While talking about the collaboration with Tedder, Gavin told The Examiner: "“I think Ryan did a great job with featuring piano up front with the vocals.”"
"You create this scenario - you see them in your dreams and if you bumped into them, you would let them know that you're doing fine and you're past the breakup - but you'd be lying." —Gavin DeGraw told AOL Music about the song meaning. The song poignantly evokes the difficulty of getting over someone. "'Not Over You' is about trying to get past someone emotionally," DeGraw explained to AOL Music. DeGraw expanded on the song to AOL Music: "It's kind of riding that line between vulnerability and pride. You're saying 'If I saw you, even though I'm missing you, I wouldn't tell you I was missing you.' That may or may not be a masculine trait, but I do know it's prideful and vulnerable. I've been there, so that's why I got behind the song, and I know a lot of people have been there too, it's just real. You don't always have to be romantic - sometimes it's important to just be real." Scott Schelter from "Pop Crush" realized that "The song finds DeGraw in a seriously depressed place. He sings about listening to the radio while staring at a picture of his ex and wishing they could still be together." It features a jangly piano and artificial drum beat. Scott Schelter wrote a very positive review for "Pop Crush", writing that "the music manages to stay vibrant thanks to lively drums and DeGraw’s keys. While commenting that "the hook is a bit more thoughtful and complex than many choruses in pop music." Emily Exton wrote for "Pop Dust" that "“Not Over You” is standard DeGraw fare: introspective tales from the nice guy, with a piano-driven melody, becoming catchy to the point of delirium." Ken Capobianco wrote for Boston Globe that the song is "a manipulative slice of mope pop." Andy Baber of musicOMH wrote that "Its slick production and niggly technical effects clearly align the song with Tedder’s previous work, yet DeGraw’s excessively worded chorus comes across as awkward and emotionally faux." A screen capture from the four-minute music video, where DeGraw is pictured on the right singing the song emotionally into a microphone while playing the piano with a band, and the band's drum is pictured on the left. The music video was released on his page on YouTube/VEVO on June 28, 2011. It features shots of DeGraw and his love interest (played by Marjorie Levesque) being separate from one another throughout much of the video in various parts of the city, but meeting and kissing in the end. The video has garnered over 19 million views on YouTube/Vevo. The video begins with DeGraw lost in thought and in full search of his girlfriend from the past. Later, the girl is shown watering plants. Suddenly, the shot goes to a split screen of her and the heartbroken man. The video continues with the split shots periodically, bouncing back and forth from two DeGraws to two of the girl scouting around town. In comparing the split screen images, it becomes evident that DeGraw is on this girl’s mind, too, as they seem to be doing the same things at the same time, only in different places. She finally gets the nerve to go to his place, but unfortunately, it is just a minute after he has left home looking for her. By the end, the girl runs off into the streets and bumps into him, and they share an emotional embrace and decide to get back together. DeGraw first performed "Not Over You" on the Today Show on September 15, 2011 and then the next day on Live! with Regis and Kelly. The song was also performed by DeGraw on Jimmy Kimmel Live! on September 20, 2011, and on Fox & Friends on September 21, 2011. On January 9, 2012, he sang "Not Over You" on Conan and also on The Ellen DeGeneres Show. DeGraw performed the song during the finale of The Voice of Holland's second season. DeGraw performed "Not Over You" and "Sweeter" on Jimmy Kimmel Live! on May 21, 2012. Country music artist Sara Evans recorded the song for her 2014 album, Slow Me Down. On her version, Gavin DeGraw provides harmony vocals. 1 2 3 "iTunes - Music - Not Over You - Single by Gavin DeGraw". iTunes. Apple Inc. Retrieved 14 September 2011. 1 2 3 4 5 6 7 "Not Over You by Gavin DeGraw - Songfacts". Songfacts. Retrieved 14 September 2011. ↑ Trust, Gary (26 January 2012). "Weekly Chart Notes: Adele, Kelly Clarkson, Gavin DeGraw". Billboard. Retrieved 28 January 2012. ↑ Tuin, Marian (June 22, 2011). "Gavin DeGraw discusses new album 'Sweeter'". The Examiner. Retrieved 14 September 2011. 1 2 Shelter, Scott (May 17, 2011). "GAVIN DEGRAW, 'NOT OVER YOU' – SONG REVIEW". Pop Crush. Retrieved 14 September 2011. 1 2 Baber, Andy. "Gavin DeGraw – Sweeter – album reviews – musicOMH". MusicOMH. Retrieved February 3, 2012. ↑ Exton, Emily (22 June 2011). "The Singles Bars: Gavin DeGraw - Not Over You". Pop Dust. Retrieved 14 September 2011. ↑ Capobianco, Ken (September 20, 2011). "Gavin DeGraw - ALBUM REVIEWS - 'Sweeter'". Boston Globe. Retrieved 22 September 2011. ↑ "Gavin DeGraw - Not Over You - YouTube". YouTube. 28 June 2011. Retrieved 14 September 2011. ↑ Hensel, Amanda. "GAVIN DEGRAW HITS THE STREETS IN NEW 'NOT OVER YOU' VIDEO". Pop Crush. Retrieved 14 September 2011. ↑ "Gavin's Interview And Performance On The Today Show". gavindegraw.com. September 15, 2011. Retrieved January 28, 2012. ↑ "Gavin's Appearance on Live! With Regis and Kelly Rescheduled". gavindegraw.com. August 10, 2011. Retrieved January 28, 2012. ↑ "Watch an Encore Performance of Gavin DeGraw on Jimmy Kimmel Live!". gavindegraw.com. September 30, 2011. Retrieved January 28, 2012. ↑ "Gavin DeGraw Performs 'Not Over You' From New Album 'Sweeter' on Fox and Friends". Fox News Insider. September 21, 2011. Retrieved January 28, 2012. ↑ "Watch Gavin's Performance on Conan O'Brien". gavindegraw.com. January 10, 2012. Retrieved January 28, 2012. ↑ "Gavin DeGraw Performs 'Not Over You'". The Ellen DeGeneres Show. WarnerBros.com. January 9, 2012. Retrieved January 28, 2012. ↑ "The Voice of Holland - Gavin Degraw, Not Over You". Retrieved January 28, 2012. ↑ "Birdy, Taio Cruz en Gavin DeGraw in The Voice-finale" (in Dutch). nu.nl. January 17, 2012. Retrieved January 28, 2012. ↑ "Gavin DeGraw Performs "Sweeter"". YouTube/Jimmy Kimmel Live!. May 21, 2012. Retrieved May 22, 2012. ↑ "Sara Evans Releases Behind-the-Scenes Making of Slow Me Down; Reveals Album Cover and Track Listing". Sara Evans.com. Retrieved January 16, 2014. ↑ "Australian-charts.com – Gavin DeGraw – Not Over You". ARIA Top 50 Singles. ↑ "Ultratop.be – Gavin DeGraw – Not Over You" (in Dutch). Ultratip. ↑ "Gavin DeGraw – Chart history" Canadian Hot 100 for Gavin DeGraw. ↑ "Nederlandse Top 40 – Gavin DeGraw search results" (in Dutch) Dutch Top 40. ↑ "Charts.org.nz – Gavin DeGraw – Not Over You". Top 40 Singles. 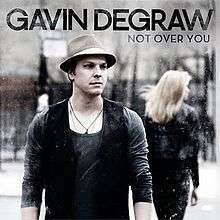 ↑ "Norwegiancharts.com – Gavin DeGraw – Not Over You". VG-lista. ↑ "Gavin DeGraw – Chart history" Billboard Hot 100 for Gavin DeGraw. ↑ "Gavin DeGraw – Chart history" Billboard Pop Songs for Gavin DeGraw. ↑ "Gavin DeGraw – Chart history" Billboard Adult Pop Songs for Gavin DeGraw. ↑ "Gavin DeGraw – Chart history" Billboard Adult Contemporary for Gavin DeGraw.